What if, one day, insects became - just like the FAO told us - the new ‘philosopher’s stone’ of nutrition? The SIAL reviews websites and startups that invested in these sources of protein, calling them “eco-logical”. Explanations. This is what was revealed in the 2014 IPSOS/Viragor study, which aimed to analyse the current evolution and future of food in five sample countries (France, Germany, Japan, the United States, and Russia). However, we will have to change our habits and customs, the 2013 report of the FAO (The United Nations Organisation for Food and Agriculture) tells us, in order to meet the major challenges of the 21st century, especially those such as agricultural and food resilience. “Insects are nutritious, with a high content of protein, fat and minerals, and can be consumed whole or ground into powder or paste, and incorporated into other foods” explain the UN experts. Population growth, depletion of resources, changes in food habits in developing countries and pollution of the planet, these are all factors which indeed call for revision of our old production models, such as intensive agriculture. One part of the program of alternative models raised by the United Nations: insect farming. Behind this somewhat ‘barbaric’ word hides the ‘new black gold’ of the food of tomorrow. It involves the breeding of edible insects on a large scale. From Mountain View in the Silicon Valley of South East Asia to European businesses, the breeding of insects intended for domestic food production incites the agri-food investors to take a more scientific approach, orientated towards biotechnology, scientific data, high tech, vertical farms or even new sources of protein. It is therefore not surprising that the stakeholders of the new economy see a network of start-uppers building up at a rate of knots around this protein of the future, viewed as “healthy and sustainable”. 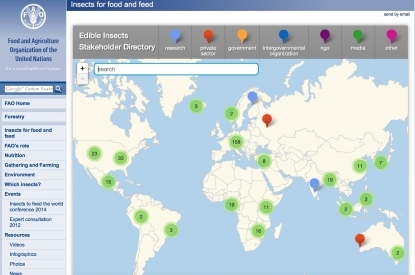 This is a discernible influence on the interactive map of the FAO dedicated to its program “insects for human and animal consumption’. Among investors : New Protein Capital - an investment company based in Singapore, whose founder Matthieu Vermersch, is French. The latter invested in the startup Ynsect, proposing to replace fishmeal with the flour of worms, a way to respond, as explained by co-founder Alexis Angot in Maddyness magazine, to the rise in the price of fishmeal, which has tripled during the last six years. According to him, ‘there is an urgent need to develop alternative sources of protein with high quality and a competitive price’. Micronutris is the first company in Europe to produce insects intended for human consumption. In order to democratise this food resource including around 1900 edible species, the company launched insect pastes in 2015. According to Cédric Auriol, young director of the company, eating insects contributes to the ecological effort: “Insects are a natural and sustainable solution. Breeding them gives off up to 100 times less greenhouse gasses than conventional breeding, and needs less surface area and less nourishment. From a nutritional standpoint, this is also a very interesting food, rich in proteins, in minerals, in Omega-3, and low in fat” he explains to LaDepeche.fr. Some entomophagy evangelists tend to emerge, catching public attention, like Katharina Unger, consultant for the design of edible insects and co-founder of the company “Livin’ Farms”. 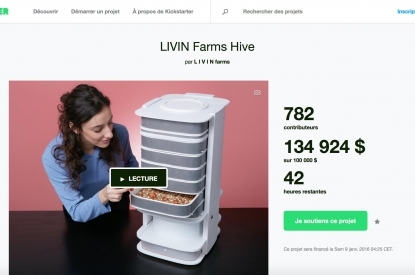 This startup proposes to build its own insects breeding "hive" to produce “home made” worm flour for your daily diet. Insects: the new philosopher's stone of nutrition? Consumed by already more than 2 billion people around the world, the equation of the 21st century does not seem to allow us to exclude this scenario on our plates: we are going to have to feed 9 billion human beings by 2050, and thus we must practically double current food production. Some great leaders of the world, like the Brazilian Alex Atala, are already engaged in working towards their aspirations. He has launched an institute for rethinking the relationship between humans and food, explaining his interest in “new borders of flavour”, those of the Amazon, where he found, for instance, Saúva ants. A logical approach, according to him, since “the Amazon represents 47% of Brazil and it is therefore natural that it takes up at least 47% of my culinary research”. Some food for thought for our plates!